^ Barthalmus, George T.; Zielinski, William J. Xenopus skin mucus induces oral dyskinesias that promote escape from snakes. Pharmacology Biochemistry and Behavior. 1988, 30 (4): 957–959. PMID 3227042. doi:10.1016/0091-3057(88)90126-8. 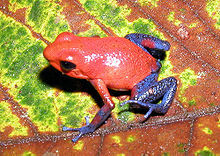 ^ Savage, J. M. The Amphibians and Reptiles of Costa Rica. University of Chicago Press. 2002. ISBN 0-916984-16-8. ^ Duellman, W. E. The Biology of an Equatorial Herpetofauna in Amazonian Ecuador (PDF). University of Kansas Museum of Natural History Miscellaneous Publication. 1978, 65. （原始内容 (PDF)存档于2011-07-04）. 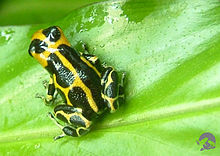 ^ Grant, T. Poison Dart Frog Vivarium. American Museum of Natural History. [2012-07-07]. ^ Hayes, Floyd E. Antipredator behavior of recently metamorphosed toads (Bufo a. americanus) during encounters with garter snakes (Thamnophis s. sirtalis). Copeia (American Society of Ichthyologists and Herpetologists). 1989, 1989 (4): 1011–1015. JSTOR 1445987. doi:10.2307/1445987.